“Without Warning” truly hit me without warning. I had no idea this album was dropping so quickly and when I finally did first hear about it, I thought there was no way. 21 Savage has a new album coming out, with Offset and Metro Boomin, just a few months after he released “Issa Album” and while still at the top of the charts with Post Malone for “Rockstar?” Well there’s no way it can be that good I mean… wait never mind, this album truly is great. Whenever I listen to an album for the first time, I usually just listen all the way through. At the end of each song, I either let it keep playing and do nothing, or I save the song to my personal library and then continue on with the rest of the songs. By the time I reached “Darth Vader,” the last track, I looked back at my saved songs and found I had saved nearly the whole album to my library. 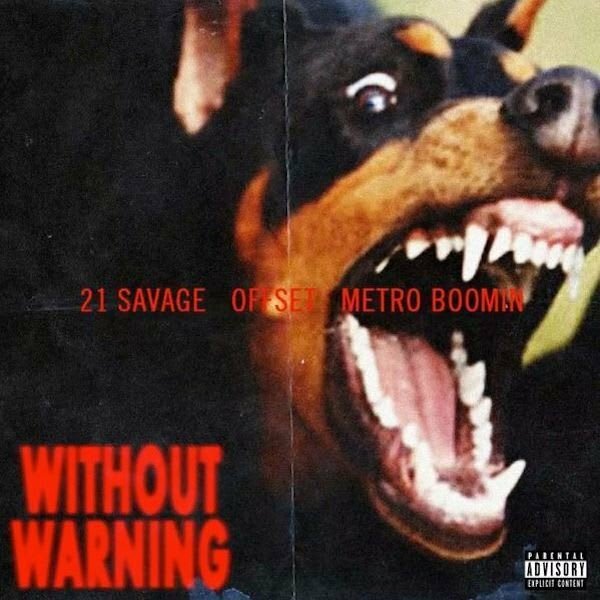 While earlier this year I talked about 21 Savage’s “Issa Album” being a breakout album, landing him near the top of rappers to lookout for, I think “Without Warning” just proves that point even further. But this time, he brings a few other artists with him. Migos, a three man group that if you listen to the genre at all, you’ve probably heard one of the members in at least one song every few weeks. Quavo, Offset and Takeoff are the dynamic trio that make up Migos. While we hear from Quavo in “Rap Saved Me,” it is still Offset’s collaboration with 21 Savage and Metro Boomin. Because it is his, he sure did knock it out of the park. Every single track he is featured in is a song I am going to be playing for the next few weeks. From what I have heard from Offset before “Without Warning” and what he showed me on it, Offset is starting to separate himself from the rest of the group. His lyricism and beats are what make him so fun to listen to while Quavo relies more on his features. Both great overall but, Offset truly shines on this album. Going back to what makes “Without Warning” so great, it is just so many things. While most albums seem to dip at some point, this one never really did. Every track felt like it could have opened up the album and I think a reason for that is the fact that it is only 10 songs long. There is no fluff, only quality. 21 Savage shows why he’s having a year we shouldn’t forget, Offset keeps proving why he’s the best rapper in Migos, and do I really need to say anything about Metro Boomin? Seriously, there isn’t a bad track on this album. Gabe Hypes can be reached a ae.spectator@gmail.com.